What makes our job here at DC Comics News brilliant is that every now and then we get to speak with some of the industry’s amazing and dedicated writers and artists. In this occasion we had the honor to interview a current DC Comics’ artist, Ben Caldwell. Ben Caldwell has worked in notable projects like Action! Cartooning (a series of ‘how-to’ books), The Dare Detectives (a must-read story involving some particular bunnies), All-Action Classics and Wednesday Comics: Wonder Woman. Some recent projects including Superboy: Futures End, Infinity Inc. and of course PREZ. DCN: First of all, from the staff at DC Comics News, we want to thank you for your time. So lets start with the questions shall we? 1. DCN: We know you are an artist in the various senses of the word, but specifically, what inspired you and/or motivated you into becoming a comic book artist? BC: I always wanted to write/draw comics and I tend to think out stories in comics’ language, it just makes sense to me. I think the fact that comics were so easily available in my childhood was also a big factor. Growing up fairly poor, without video games or a color TV or a lot of toys or trips to the movies, comics were a cheap passport to millions of different worlds and stories. Both as a reader and as as potential creator, I was always amazed that ANYTHING could happen in a comic — it just had to be imagined first! That’s something that I still keep as a mantra while i’m working: anything can happen in a comic — it just has to be imagined first! 2. DCN: In regards of your art in general, what helps you choosing the tone of your drawings, is it depending on the book you are working on at the time or do you have a specific drawing style when working on comic books? BC: I definitely have a general sensibility, which I think shows consistently through my work. But yes, I tailor my art to each project as needed. In the end, all that matters is how the story reads, and I don’t want to interfere with that by injecting something into the project that doesn’t mesh with either the story, or the what the audience is supposed to ultimately experience. It helps that I like to draw in a broad range of styles. But it also goes beyond what most people might think of in terms of art “style”. I also try to amplify the story through the layout of panels, camera angles, lighting, etc. For example, “Wednesday Comics: Wonder Woman” had a fairly aggressive page layout, which I felt was necessary for the story I was telling and the format within which I had to work. 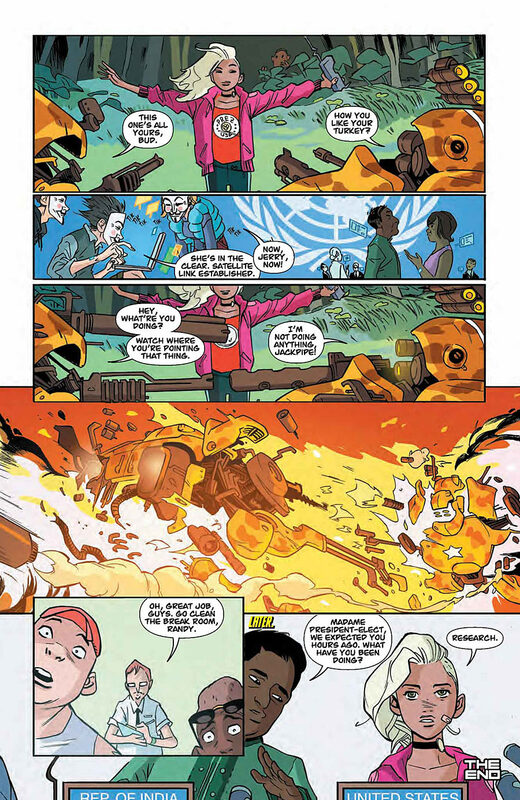 Something like “Infinity Inc.” has a much more conservative layout, with a far greater focus on giving the characters breathing room, to interact. 3. 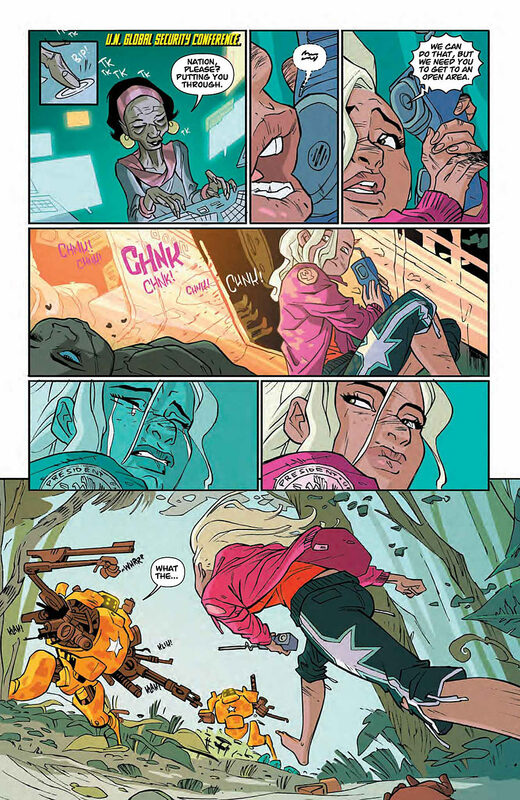 DCN: After reading the PREZ sneak peek, I see each panel is both meaningful and powerful in terms of storytelling. What helps you materializing the writer’s script into comic book form? BC: There’s a certain back and forth with the writer and editor about the tone of the story, how the audience should feel about various characters etc. Although a lot of that is clear in the scripts themselves. But for me, the guts of any story are the characters. So for me, perhaps the most intense part of the process is working out their expressive range and body language, and applying it throughout their scenes. All based on, and trying to express, the sort of person they are, what exactly they’re trying to accomplish at any given moment, and how they feel about the process. pretty much any scene and any story boils down to that. But usually, very little of that is specifically in the script, those are the sort of details that an artist is expected to bring to the story. 4. DCN: You have worked in various areas as an artist. From a creativity stand-point,what are you bringing to the table for the relaunch of the PREZ comic series? BC: Style, storytelling, and world-building. The trick with PREZ is that it is, in many ways, a political cartoon. A completely realistic look would undermine that element, in the same way that a gloomy color palette and jarring camerawork might detract from a romantic comedy. But an overly cartooned look would tip the story too far into farce or self-awareness, in a way that would dampen it’s sharpness. And because the story exposes you to these characters and relationships in staccato bursts, every panel and every expression has to be as effective as possible. That sort of character work is important to me, and I imagine “Superboy” and “Infinity Inc.” were good training (and good advertisements) for my taking that approach. Finally, all of my work has involved creating worlds that are either epically or marginally different from our own, with their own visual language and host of details that give them personality. This is important (and fun!) on it’s own, but it is also essential to placing the characters and their actions in an understandable context. 5. DCN: If you would have to choose another DC Comics series to work on, which one will you choose and why? BC: A Big Barda/Amethyst interplanetary road trip, obviously! 6. DCN: Also, who is your favorite DC Comics character? 7. DCN: Can you tell us about any other upcoming projects you are working on, including those outside DC? Wait, I DO have two creator-owned projects that are temporarily shelved, but will be making a reappearance in a big way soon! 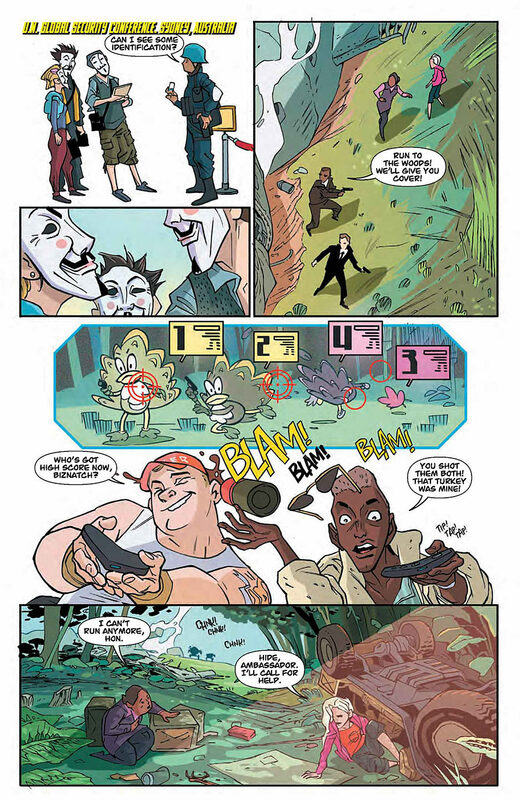 One is the award-losing DARE DETECTIVES, which has all of the tiki curses, immortal mobsters, hung-over bunnies and foiled musical numbers that you would expect in a Ben Caldwell comic. The other is THE SECRET OF ST MICHEL, which makes up for dare’s lapses by featuring all of the magical french revolutionaries, eccentric uncles, sentient toys, and pumpkin-doping that are, so sadly, lacking in modern comics. And Marvel hasn’t called me back about doing a SHE-HULK/WHITE RABBIT team-up, but that’s just a matter of time. 8. DCN: Last, but not least, do you have any advise for those DC Comics fans and comic book fans in general who aspire to become great artists such as yourself? BC: Draw a lot. Like, A LOT. Draw random stuff you never really cared about, not only does it improve your work with the things you DO care about, but you also never know when you’re going to have to draw a bunch of old ladies doing aerobics or something. Comic are weird. Draw comics. Actual comic stories. make your own, use an existing comic script, take a film and translate it into panels. I don’t care if your comics are terrible, just do it! No one ever learned to ride a bike by just sitting on one, no one learns to draw comics by making endless head shots. Look at lots of non-comics visual storytelling. film and animation are obvious choices. There are TONS of sites dedicated to how filmmakers frame certain shots. Or move characters and action around on the screen (or how to NOT do it). Recently there have been a billion sites dedicated to storytelling in “Fury Road” ALONE. Ditto for animation. And never forget that individual drawings are supremely unimportant. Individual drawings come and go. But the relationship between the creator and their process of creation is permanent. so never scare yourself away from your work because one picture (or one part of one picture!) isn’t working. Take it as far as you can, then move on to the next thing! there will ALWAYS be chances to tackle those same problems at a later time. Become comfortable with the process of working through all your visual problems, rather than obsessing over solving one problem. DC Comics News would like to extend a huge thank you to artist Ben Caldwell for his time and for providing such an interactive and informative interview. Take a look at the full sneak peek of PREZ below, plus some work from Mr. Caldwell at penciling said sneak peek and more.